Catherine Murphy hand-sculpts each copper piece, giving it a sweet swing that really moves. Together, you might just touch the sky. 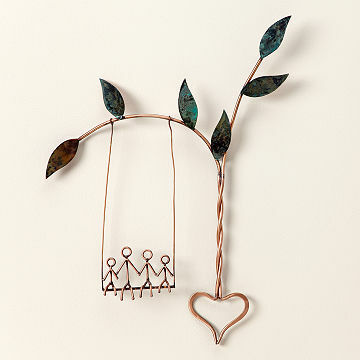 Catherine Murphy's copper sculpture is a tribute to a love that's both grounded and soars to great heights. She hand-sculpts each piece, giving it a vibrant patina and a swing that really moves (don't worry, the swing still has room to move when you hang it. It's a sweet reminder of the simple pleasures in life—like each other's company. Hardware not included. Handmade in North Carolina. Great decoration. Lovable piece of art. Exactly as described. I love it! Perfect Gift for someone you love! This arrived today 2/13, just in time for Valentines day. It's beautiful and I can't wait to give it to my husband tomorrow. not up to uncommon goods standards.